Anchorage, Alaska - Alaska Republican Senator Lisa Murkowski has secured $6 million in federal funds to build a road leading straight to a plot of land she bought - but was forced to sell - after being exposed July 16th by the TPMmuckraker website. An August 7th article by Laura McGann and Paul Kiel at TPM, also says that her father, Alaska ex-governor Frank Murkowski, diverted $325,000 of state money while he was in office to her road. 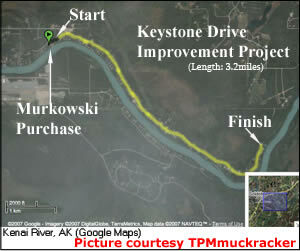 From TPM - Sen. Ted Stevens (R-AK) and Rep. Don Young (R-AK) rounded up an extra $2 million for the three-mile road project, which is just under half mile from Murkowski's plot, which she sold back to Penney in the wake of the controversy. And even that's not all. To cover matching costs required by some of the federal money, Murkowski's father, then-Gov. Frank Murkowksi ponied up another $325,000 in state funds. It's unclear whether the project, construction for which is set to begin next year, will boost the value of the land. Here is the list of the Republican friends who chipped in taxpayer's money for Lisa's road. Millionaire real estate developer, Bob Penney has claimed to be remarkably ignorant of the true value of the riverfront property he sold to Sen. Lisa Murkowski (R-AK) last year. TPM has tape of him saying otherwise last April - just before the sale!